What is WITCH: Fated Souls? 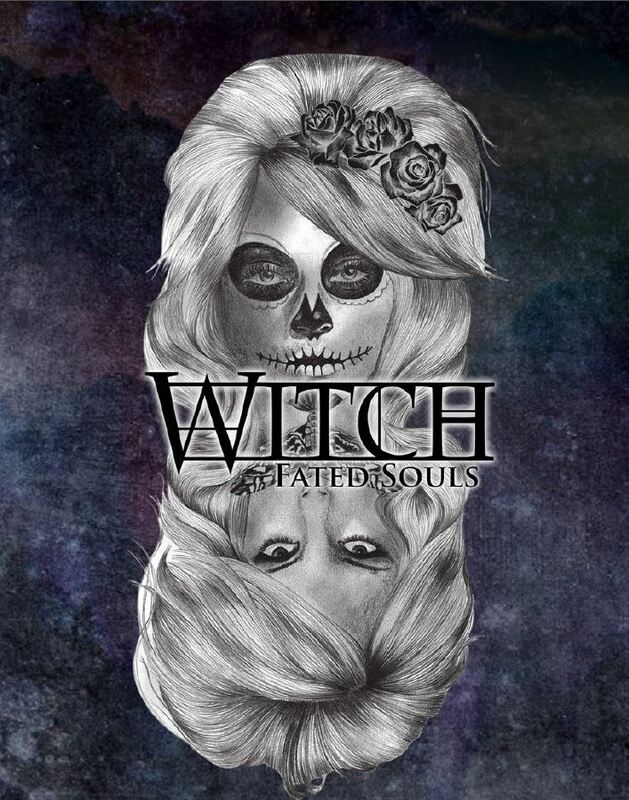 WITCH: Fated Souls is a dark, modern fantasy role-playing game. You play a member of the Fated, a person who has sold their soul to a demon for power. The mysteries of magic and the countless wonders of our world are now yours. While you explore the cosmos you must be wary. Hunters and other antagonists lurk in the shadows ready to strike, but most of all, watch out for your demon. Can you beat your demon at their own game and regain your soul? Embrace your fate and find out. So you’ve got no soul… What are you going to do about it? What are you planning on doing about your lot in life? Are you going to just accept that your soul is gone, and make the most of your powers? Are you going to hold out hope that you can get it back somehow, despite most Fated believing it’s impossible? Will you bargain with your demon for more power, despite what it may cost you or, worse yet, your friends and loved ones? The way I see it, at its core, WITCH is a game of coping with a very personal loss, and what that loss drives you to do. There are other motivations and themes of course, but that’s the big one for me. Honestly, it feels very New World of Darkness (or more correctly, Chronicles of Darkness (CoD), as it’s known since the changes in ownership and so on earlier this year) , so much so that I almost suggested Witch: The Fated to fit the CoD naming pattern as a joke when the call for suggestions for names went out during the Kickstarter campaign. The modern setting with a hidden world of magic in it feels almost exactly like the idea behind CoD, the concept of a “world like our own, but with deeper shadows.” Everything familiar is there, in terms of technology, social structure and so on, but there’s more to it. The things that go bump in the night are real, and the world is a scarier place than we realise. Given that the CoD games are collectively one of my favourite settings (with the exception of the God-Machine, but that’s a rant for another day) since I burnt out on traditional fantasy RPGs a few years ago, so this is kind of perfect for me. The setting section does have some really solid work detailing the history of the world and the current setting, as well the other planes of existence. It’s a fun read, and definitely a good starting point for a GM looking to run a game. The creatures section of the book is a bit short, but what’s there has plenty of variety and provides a good feel for the kind of foes your players will come up against. The sections with important characters and descriptions of the various types of demon are a nice touch as well There are definitely some bits that could use more fleshing out, but that’ll hopefully come with time as more books are released. I know there’s at least one more book that’s been announced, so I like the odds. One thing I want to mention, but can’t go into too much detail on, is that I really appreciate the inclusion of a section dealing with the end game. It’s not just a case of “kill bad guys, adventure ends, characters retire.” There’s a real mystery inherent in the setting for the characters to work towards uncovering, and I personally think it’s fantastic. Plenty of suggestions are provided on how to run it for members of each Fate, and it’ll make it much easier for GMs wanting to run long campaigns to come up with a satisfying conclusion when they’re finally ready to wrap it up. The Fated come in seven varieties, again reminiscent of the clans, lineages and so on from the various CoD games. Each is beholden to a different type of demon, and have their own spells and special abilities and weaknesses. A portrait of the sample character for the Djinn Fate. Djinn are a subversion of the usual formula, in that they didn’t actually give their soul to a demon, but were instead chosen by something called the Quiet at a moment of total desperation. The end result is the same, as their soul is still gone, but they didn’t make a conscious choice. As the name suggests, their spells revolve around the granting and manipulating of wishes. If someone tells them a serious lie, they’re driven to seek justice for it, suffering penalties in stressful situations until they do this. Additionally, the granting of a wish will set off the magical equivalent of a flare, essentially announcing their presence to anyone in the area with the ability to sense it. Finally, a Djinn gets three free personal wishes over the life of the character (and yes, there are safeguards to stop them just wishing for more wishes or asking for their soul back). Druids are fated by spirits known as the Horned Beasts, and come in two varieties, Fuil (Blood) and Nádúr (Nature). This choice changes their spells, but both share the same traits. Fuil Druids are the warriors of Fated society, able to control the elements and go into a battle frenzy. The Nádúr Druids on the other hand are protectors and healers, able to block attacks and heal wounds, as well as communicating with plants and animals. Their their special ability allows them to see glimpses of significant events in important locations, or in the history of a person’s family. Additionally, due to their passionate personalities, they suffer penalties to rolls when in a highly emotional situation. Heks are fated by the cruel Devils, which torment and taunt their Fated, haunting them with visions of what awaits them after their death. Their spells revolve around telekinesis and the ability to place curses, with the curse being an extremely flexible spell. They’re also the only Fate to receive a familiar, a magical companion animal with its own powers and abilities. Their weakness is a result of the torment from their devils. They either suffer from severe nightmares, resulting in a chance of a significant penalty to a roll once per session, or some form of insanity, causing a lesser penalty that applies to any stressful situation. Lich are fated by Preta demons. Their spells revolve around gathering knowledge and manipulation of death and decay. They’re functionally immortal unless their heart is destroyed (the Preta take their heart at the moment of fating and place it in a phylactery), but if their body is destroyed they need to negotiate a new deal with their demon to gain a new body, and if their phylactery is ever destroyed, they’ll be permanently killed. Finally, they suffer significant penalties to social rolls involving non-Lich characters, due to the fact that their bodies continue to wither and decompose over time. Seers are old souls who have escaped the underworld and possessed bodies where the original soul has already fled. They have no memories of their previous lives, and no powers, until an Amit demon recognises them as an escaped soul and wishes to reclaim it. In exchange, they’re given the powers of a Seer. Their spells involving controlling their visions of the future and summoning swarms of small animals for various purposes. Their power is also their weakness, as they can’t choose when they have a vision, and are incapacitated for the duration of them. They also carry a mark of their time in the underworld, causing social penalties when the disfigurement is visible, and over time will start to receive more and more flashes of their past lives. Sósyé are fated by spirits called Reynards, that they don’t believe to be demons. Reynards are trickster spirits, and seem to be at least partially inspired by stories of voodoo and loa, and are easily the kindest of the powers to be fated by. Their spells involve creating zombies and magical talismans, reinforcing the voodoo aspects of this fate. They can call on their Reynard to ask for an answer or advice, though they can’t be sure if the Reynard is lying to them. Additionally, at particularly awkward moments, the GM can choose to inflict a penalty on social rolls. If one of these rolls is failed, the Sósyé will be compelled to lie to whoever they’re speaking with. Yokai are fated by the shape-changing Oni demons, who they maintain a fairly civil relationship with. Unlike the other fates, Yokai have three spells, related to changing their form, and increasing and decreasing their size. In addition to their spells, each Yokai is able to change into one specific animal of their choice at will, though they are incapable of using their magic in this form. Their weakness is the difficulty they have showing that they care, resulting in a penalty when trying to express certain emotions. Character creation involves choosing your fate, then using a point based system to purchase your beginning attributes, skills, spells, pursuits and talents, with each having their own pool of points. Attributes are very similar to the old familiar d20 ones with a few additions. This is one area I actually wish they had pared it back a bit, for example I think Charisma and Manipulation could have been covered by the same attribute, as could Perception and Wisdom. Skills are the usual hodgepodge of utility (stealth, intimidation, knowledge and so on) and combat skills (explosives, ranged and melee). Pursuits are a measure of how well off your character is in various aspects, ranging from wealth to prestige in the magical society. Talents allow you to customise your character’s skill in certain aspects of their magic, and give you additional bonuses for talent that you chose to specialise in. Honestly, some of the talents are more useful than others, meaning you’d be very unwise to not take at least some ranks in them (Casting in particular is very important, as it straight up adds a bonus to your rolls for casting spells). Spells are arranged into sets a cantrip and six cantos. The cantrip is free but the cantos must be purchased in order from lowest to highest for each spell. Finally, when it’s all done, you get given a pool of “freebie” points, usually 10, that can be spent on anything you choose for varying costs (a canto will cost you all 10, while a skill or pursuit rank will only cost 2). Like I said, I think attributes could have been simplified a bit, and skills could probably use the same treatment (is there really a need for an explosives skill in a game about people who sold their souls for magic? ), but I guess the advantage is that it’s pretty familiar territory for anyone who’s played a game with a similar attribute/skill system, could make for an easier transition to the new system. I like the talents, but think they could have used a little more balancing so that there wasn’t such a clear advantage to taking one over the others, likewise some of the focus bonuses range from being very useful to being flavourful but kind of useless. Buying spells is simple, no issues there. The only bit I’m really not sure about is pursuits. I feel like they could have been condensed a bit. For example, having both Funds and Property feels a bit odd to me, I’d have just made a single one called Resources. As it is, if you want a rich character with a nice house, you have to buy sufficient ranks in both pursuits, which means you’re restricting how much you can do with other pursuits. It’s a good idea, I think it just needed another pass. Character advancement is handled through incremental improvement rather than levels. You save up XP until you have sufficient to buy the next rank of whatever you’re looking for, then away you go, hopefully with some role-playing justification for how you’re improving. Simple, easy to understand, and perfectly functional. However to increase your Spell Level and become able to learn higher level cantos, you have to earn a separate type of XP called Spell Experience. Once you’ve got enough of that, you can summon your demon and barter for more power. The player is guaranteed to increase their Spell Level, the question is what their demon will ask for in exchange. I’m a big fan of this as it changes advancement from a plain power increase to a chance for some really great role-playing. There are also optional rules to use a Devils Deck, which can be purchased from Angry Hamster Publishing (I have one from the Kickstarter, and it’s gorgeous), as a tool to try and get a more beneficial deal out of your demon, though it also gives the demon a chance to force things further in their favour if they’re lucky. The core resolution mechanic used by WITCH is one that’s going to be familiar to pretty much anyone who’s played a d20 based game before. You’re given a target number for your task, which you attempt to beat by rolling some dice and adding appropriate modifiers depending on difficulty of the task and your character’s capabilities. The average difficulty for a roll is 13, but this can be adjusted as needed by the GM for easier or harder tasks. A natural result of 2 is a botch (you fail horribly), while a natural 20 is a critical success (you did what you were aiming to and then some). The only real difference here is that instead of rolling one d20, you’re rolling two d10 and adding them together, meaning the probability map of potential results is a bell-curve rather than equal chance of any result you get from a d20. Long story short, this makes it more likely that your outcome is going to be somewhere around the average of the two dice, with very high or low results being statistical outliers, so your modifier values are very important. Overall, pretty standard though. It works, it’s simple, so I’ve got no complaints. Skill rolls are a pretty standard affair. Pick a skill and appropriate attribute, roll 2d10, and add it all together. Dexterity + Athletics could be used to chase someone down, while Strength + Athletics could be used to lift something heavy. Opposed rolls are the same thing, but you’re trying to beat what the opponent rolls. Talents can be used in a similar way, for example using Intelligence + Casting to determine what spell someone is casting, or Wisdom + Potions to help identify useful ingredients for brewing potions. Combat is once again going to be familiar to anyone who’s played before. You roll initiative to determine the turn order (2d10 + the higher of Dexterity or Perception), then everyone gets their turn. Like most games, you get an action and movement. Attacks are rolled as 2d10 + Dexterity + Melee/Ranged skill as appropriate, and the goal is to beat the opponent’s Combat Difficulty, which is 11 + Dodge (though certain other factors may adjust this). If you hit, you subtract any armour value your target has from damage, then apply the damage. As you take damage, you’ll start to take more penalties to your actions, to represent the wounds you’ve received. There are special manoeuvres and so on available, but that’s the basic gist of it. Casting spells gets a little more complicated. While cantrips can be cast at will, casting a canto requires a roll. The roll is the same as normal (2d10 + Spell Level + Casting Talent), with the target depending on the difficulty rating for the canto you’re attempting to cast. However, as you repeatedly case the same canto in a day, the chance of botching the casting increases. For example, if you’ve cast canto I of a spell three times, you’ll now botch on a roll of 2 – 5 instead of just a natural 2. Where this gets really bad is if you push yourself stupidly hard, raising the botch chance for a canto to 15 or higher, and you botch the casting roll, you create something called an Eternity Chasm, something described as a magical atom bomb capable of causing untold horrors (effectively giving the GM a chance to do whatever the hell he wants for a bit, including causing a total party kill if the situation is dire enough). Additionally, the botch chance only lowers at a rate of one per night of rest, or when the GM decides something exceptional has happened to justify it, so overusing a single canto can lead to problems very quickly. I really like this mechanic, it adds some real risk to the casting, while still allowing players to access their abilities if need be, unlike the Vancian casting system often used for magic, where once you’re out of spells for the day, you’re done. Performing rituals and brewing potions function in the same way, just substituting the appropriate talent for the Casting talent when making the rolls. It’s also possible to botch these rolls, and the chance of doing so increases in the same way as for spells, but I’m not sure if it’s possible to trigger an Eternity Chasm off them (if I find out the answer, I’ll come back and update this). Mechanically speaking rituals are basically learned spells that have specific incantations and so on required for them. Potions are bottled spells triggered by drinking them. There are guidelines for altering spells to suit your character more, but as this is really up to the player and GM to negotiate, I’m not going to go into that here. There are also higher level spells, but they tie into a lot of GM only setting details and end game information, so I’m not going to talk about that. Artefact creation rules seem pretty standard (choose abilities, set difficulty, roll etc.) so I’ll leave that alone too. Mechanically speaking the game seems solid. I think at times it cleaves a little too close to traditional d20 aspects, but it’s not a major issue. I think if I have any complaint, it’s really just that they played it a bit too safe during the design phase. I’d have liked to see some of the more traditional gaming elements stripped back. Lower the number of attributes, streamline the skills a bit, that kind of stuff. But honestly, it does what it’s meant to, and it does it well without being overly confusing, so I can’t say I’ve got any serious problems with it. 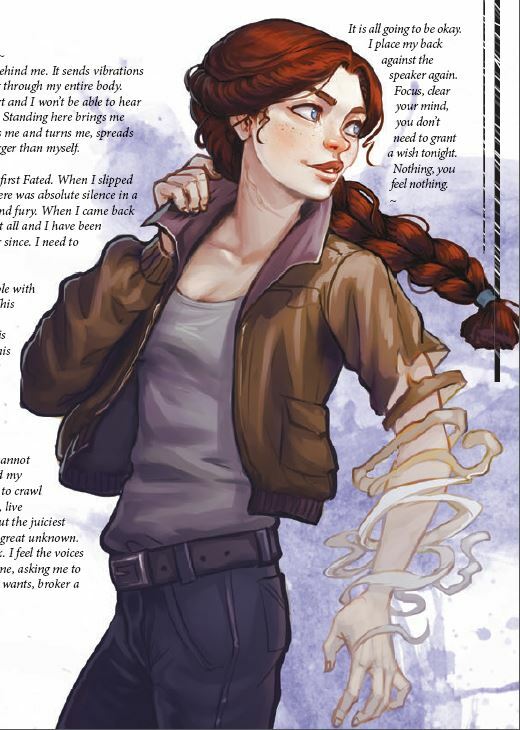 WITCH: Fated Souls is a 208 page (including the back matter) book. The print edition is a solidly constructed hardcover book, with a nice glossy paper stock used for the interior. It’s closer to the kind of paper you’d see used in a coffee table book than anything I’ve seen used for an RPG book before. As a result of the paper quality, the background colours, illustrations and text look really sharp, very clear lines that seem to pop out of the page nicely. Due to the high gloss, I’ve found that you get a bit of glare off the pages if reading in a particularly brightly lit area, but it doesn’t really affect readability. The font used for the bulk of the text is a nice simple serif typeface (at a guess, Times New Roman, but I’m not exactly an expert on fonts), and it’s a decent size, so you aren’t squinting to read it like some books I’ve read. Fluff/fiction text is italicised, but still easy enough to read. . Tables in are clearly laid out, and alternate between white and coloured rows to allow for easy differentiation between each row. The only thing I don’t really like is the way some of the inset fluff text is on a background comprised of splashes of colour. I know it needs to be differentiated from the main text, but these are the only bits that ever game me any trouble reading them. Not all of it, and it wasn’t horribly difficult, but sometimes I needed to look a bit harder than for the rest of it. Part of the splash page for chapter 1. Artwork is plentiful throughout the book, and ranges in style from the vibrant, colourful and almost cartoonish character portraits, through sombre images of mystical artefacts and ingredients, to the black and white ink work designs used for chapter headers. Hats off to the graphic designers for this, because despite the variance in style, all of it fits the tone of the game. I actually really like the cartoon look of the characters, because I think it helps drive home the fact that the game doesn’t have to be all grim, all the time. Even a dark, serious game can have moments of humour and hope. I’d say the weakest artwork is in the creatures section, but none of it is awful, or even bad, some of just isn’t quite up to the standard of the rest of the book. The layout and organisation of the book is pretty much ideal. The introduction includes a summary of what each chapter contains, and every chapter opens with a splash page that lists what’s in it. Sections within chapters are clearly titled so you know when you’ve moved onto a new topic, and the various rules and pieces of information are arranged logically, with related sections being grouped together. When information from another section is needed, the page number is given for ease of reference. Very glad to see that there’s an index, I’ve seen an irritating number of rulebooks that don’t provide such a basic and important feature. There are a number of editing issues throughout the book, but nothing worse than any other indie RPG I’ve seen, and in fact it’s better than a lot of them. Just the odd grammatical error or spelling mistake that didn’t get picked up. Only other thing I’d say is that some of the fluff writing is oddly formal sounding, especially when it comes to conversations. I kept noticing places where contractions would have made the text flow much more naturally. These are really just nitpick complaints though, and I’m only mentioning them because I know if I didn’t, Sod’s Law would pretty much guarantee that someone would read this review, buy the book, notice it themselves and email me to complain. WITCH: Fated Souls is a seriously solid first release from Angry Hamster Publishing. Would I recommend it? Yes, absolutely. If you’re not sure, you can always just pick up the PDF for $14.99 USD from DriveThruRPG, then grab the physical book from Angry Hamster Publishing’s store later if you decide you like it enough. Look, it’s by no means a perfect game, but it’s well thought out, has an interesting premise and setting, and brings some strong design skills to the table. It’s also very much a labour of love, which was made clear by the enthusiasm thrown into the Kickstarter campaign for the game. Honestly, that level of excitement is kind of infectious, and I’m really looking forward to getting a group together sometime soon and running some games. But more than that, what I find really exciting about is that it’s such a good sign of things to come. Seeing such a strong game as a first release makes me excited to see what else they’ve got up their sleeves, not just for WITCH, but for their next project (which I won’t say anything else about, because I’m not sure if it’s been publicly announced yet). 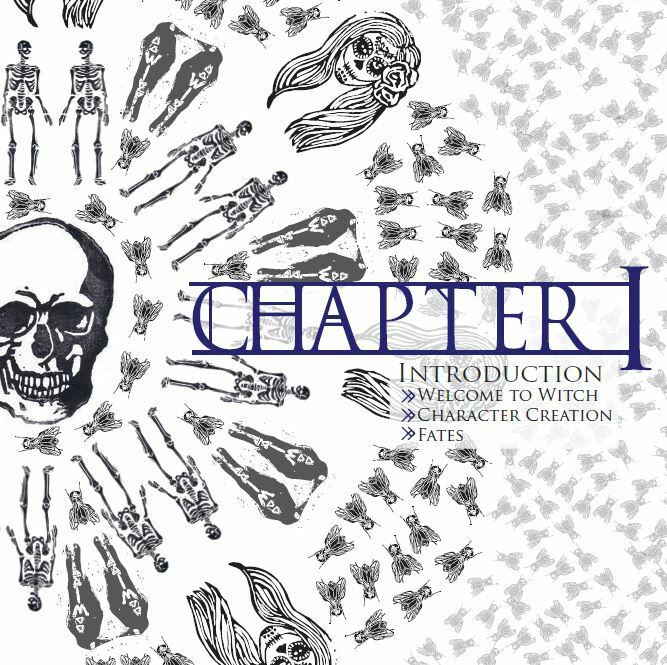 This entry was posted in Reviews and Playtests and tagged Angry Hamster Publishing, Fated Souls, Indie RPG, Liz Chaipraditkul, Review, Role Playing Game, Witch. Bookmark the permalink.